OPEC and its allies do not think their production cuts will drain oversupply in the oil market in the first half of the year. Canceling an April meeting allows the group to assess the impact of U.S. sanctions on Iran and Venezuela. OPEC and its allies are aiming to keep 1.2 million barrels a day off the market. Saudi Energy Minister Khalid al-Falih speaks to the media during Saudi government ministers brief in Riyadh, Saudi Arabia December 19, 2018. The group is delaying its decision because it expects the oil market to remain oversupplied through the first half of the year, Saudi Energy Minister Khalid al-Falih said at a committee meeting in Baku, Azerbaijan. The delay also allows the producers to assess how U.S. sanctions on OPEC-members Iran and Venezuela will affect the oil market in the coming months, several news agencies reported. The 14-nation OPEC and a group of countries led by Russia launched a second round of production cuts in January after a glut of oil hit the market and crude prices collapsed at the end of 2018. The group began slashing production in 2017 but lifted supply caps last June as oil prices rose toward nearly four-year highs and the U.S. prepared to sanction Iran, then OPEC's third biggest producer. Falih said Monday he does not expect OPEC to leave the oil market "unguided in the second half," Dow Jones reported. 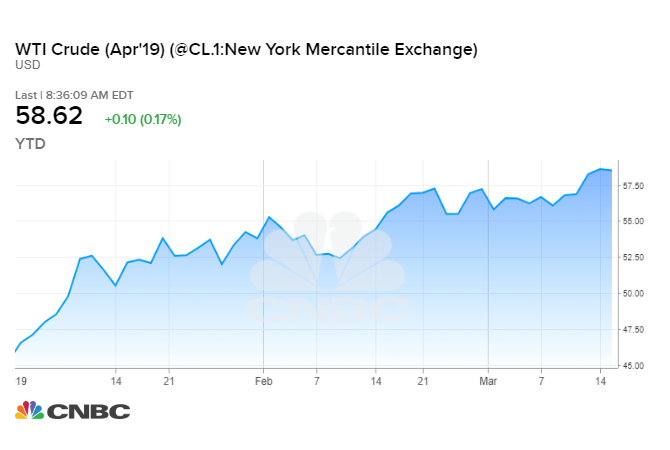 Last month, the Saudi oil minister told CNBC he was leaning toward extending the production cuts through the end of the year. Helima Croft, global head of commodity strategy at RBC Capital Markets, says the group is likely to continue cutting production throughout 2019. However, extending the cuts will highlight divisions between Russia, where partly private companies produce oil, and OPEC members like Saudi Arabia, where state-owned energy companies underwrite the nation's budget. "But for Saudi Arabia and for the rest of the OPEC producers, current prices still remain below their fiscal breakevens, so they would like to see prices a bit higher from here." The producers also want to see whether the U.S. tightens sanctions on Iran in May, Croft said. In November, the Trump administration surprised OPEC by allowing some of the Islamic Republic's biggest customers to continue buying limited amounts of Iranian crude oil — just as Saudi Arabia was pumping at record levels. Last week, the State Department's special envoy for Iran, Brian Hook, said the administration believes it has room to tighten sanctions on Iran because the oil market is well supplied. Speaking on the sidelines of the CERAWeek by IHS Markit conference in Houston, he declined to comment on whether the administration would telegraph its decision on sanctions waivers to OPEC. "It makes our job more difficult in focusing on the fundamentals, not to talk of our efforts to maintain balance and more challenging to sustain this balance going forward," he said during a press conference at CERAWeek.